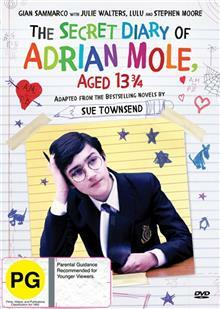 Adapted from Sue Townsend's bestselling novel, The Secret Diary of Adrian Mole, Aged 13, chronicles the everyday traumas and emotional upheavals of the legendary teenage diarist as he struggles to come to terms with life in the 1980s. Gian Sammarco is the angst-ridden scribbler w... read full description below. Adapted from Sue Townsend's bestselling novel, The Secret Diary of Adrian Mole, Aged 13, chronicles the everyday traumas and emotional upheavals of the legendary teenage diarist as he struggles to come to terms with life in the 1980s. Gian Sammarco is the angst-ridden scribbler with literary aspirations, with Julie Walters and Lulu successively portraying his mother, Beryl Reid his opinionated grandma, Stephen Moore his errant father, and Bill Fraser his elderly chum, Bert Baxter.